Muller Monthly Music Meta fans, Matt’s dissection of the July puzzle will be posted Monday morning. 20a. [Job position in which no one lasts long] REVOLVING DOOR. 37a. 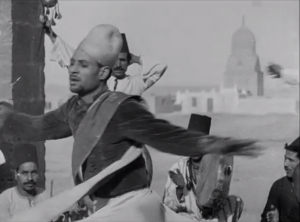 [Seemingly mad Muslim monk] WHIRLING DERVISH. How come the conspicuous consonance? 49a. [Yarn-making device] SPINNING WHEEL. No, I will not link to the Chicago song. Good, basic theme. 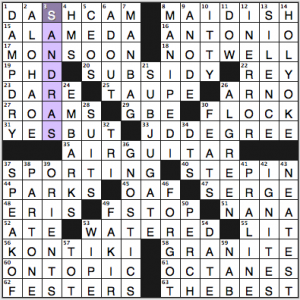 A few too many crosswordese ringers for my liking (so early in the week): ENZO Ferrari, LABAN, and arguably Theda BARA, Clement ATTLEE, Joan MIRÓ, RUHR; also some tired fill: ODE, TSE, IMAN, Omar EPPS, UZIS. Long bits are good, SURVIVOR and VONNEGUT (who was a survivor, of a sort). Liked the whole SHUCK | ZACH / MAGOO | ELHI area for its guttural vibe and look, even if the actual quality of that fill isn’t so great. Miscellanea: Very briefly considered TOQUE where APRON goes, 46d [Chef”s wear]. Does a swarm of GNATs buzz? YRS, ASSN, meh. Opened this one up and look what I found: 39a [Sack on a red-white-and-blue truck, which can hold the ends of 21- and 54-Across and 3- and 35-Down] MAILBAG. 21a. [Wild West showman] BUFFALO BILL. Hard to start with the worst, eh? 54a. [Character written in kindergarten] BLOCK LETTER. 3d. [Ticket from a postponed baseball game] RAIN CHECK. 35d. [Game accessory with 24 numbered squares] BINGO CARD. Yes, I thought first of video games, what with accessories being so prevalent. Yep, those are all things that are typically (even today!) found in the (snail) mail: bills, letters, checks, cards. I will take issue, however, with the clue for the revealer. In such descriptions, the predominant color is generally listed first, and the USPS delivery fleet is comprised of white vehicles with blue and red accents (stripes, logos, lettering). I vaguely remember an older design, with the bottom half blue (like street mailboxes), the top half white, with some red accents. Bottom line, “red-white-and-blue” isn’t a good way to characterize such a vehicle. It’s past patriotic Independence Day, so I have to assume it’s simply reflexive habit. Incidentally, 1 July this year was the fiftieth anniversary of the ZIP code. Perhaps it’s an idiosyncrasy, but I’m often perturbed by a non-theme entry that seemingly veers too close to the theme. In this puzzle, it’s 65a [Send, as packages] SHIP. Had it been clued as an oceangoing vessel or similar the infringement would have been greatly minimized; perhaps I wouldn’t even have made the connection. 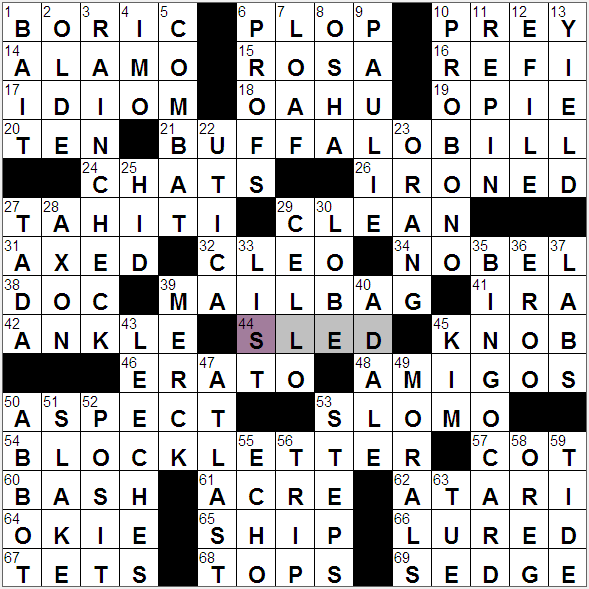 Otherwise, the fill is reasonably CLEAN (29a), befitting an early-week offering. No junk in the mail, so to speak. ALAMO, CLEO, ERATO, AMIGOS, SLO-MO, (IMO), PRO BONO, CELLO, (BINGO CARD), ECHO. Least favorite answer: 58d [Calif. neighbor] OREG. Nor am I too keen on REFI crossing REPIN in the northeast. Frequent Fiend Phenom Martin Ashwood-Smith brings us today’s CrosSynergy puzzle with a letter substitution theme. Namely, a double-O is changed to OU, as hinted at by the title. The phrase “straight shooter” becomes [Honest, but noisy guy?] or a STRAIGHT SHOUTER – I would think most people today read “straight” as the opposite of “gay” not “dishonest,” but that may just be me. [Beatles song about a Senate penalty?] clues FOUL ON THE HILL – the original song is here if you want a refresher. Enjoy the work week, everyone! Delightful themeless from the Quigley/Pahk tag team. Did you get a load of all that juicy fill? DASH-CAM ([Feature of many Russian cars], which makes those “people helping strangers on the road” viral videos possible), “YES, BUT…,” J.D. DEGREE (wow, really? [What only Obama and Clinton have, among U.S. Presidents]? I would have thought we had more schooled lawyers in the White House), AIR GUITAR, as SPORTING chance, KON-TIKI (did not know it was a [Vessel named for the Incan god Viracocha], and I don’t see how you get Kon-Tiki out of “Viracocha”), MAN BAG, MANI-PEDI, and AL GREEN. 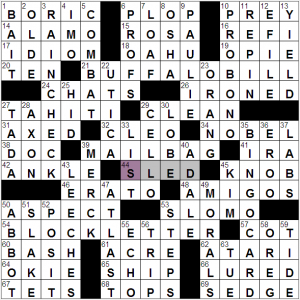 My favorite clue (could this be a contender for clue of the year?) is 3d: [Dee and Oh] for SANDRAS. 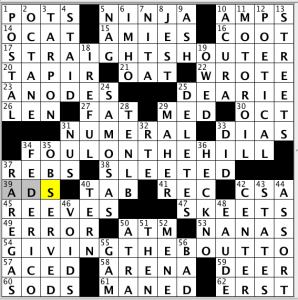 With crosswords teaching us that dees and ohs are proper ways to write “D’s” and “O’s,” the last name two-fer is a great find. 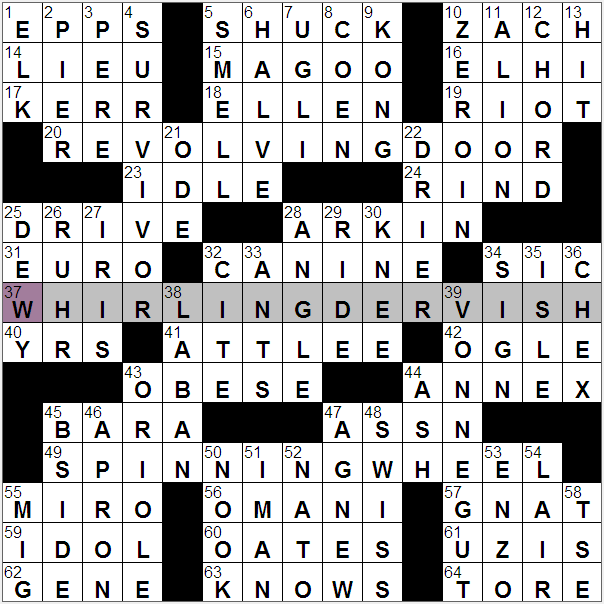 Nobody loves a plural name crossword answer, but this clue is delicious. Another nice clue: 58a. [Something hard to build with? ], GRANITE. 4.5 stars. Super smooth, entertaining. This entry was posted in Daily Puzzles and tagged Brendan Emmett Quigley, Bruce Venzke, Gail Grabowski, Joon Pahk, Martin Ashwood-Smith, Randy Sowell. Bookmark the permalink. Well if you won’t link to the nonexistent Chicago song, how about Blood, Sweat and Tears? I liked the NYT, but the BARA/LABAN crossing did me in. Nice to see VONNEGUT in the grid. I also really enjoyed the BEQ, which is a collaboration with Joon Pahk: a typically great grid with some especially nifty clues. I loved the BEQ – Joon collaboration. Great mix of words and topics. I was happy to know “El Tri” and thank Joon for that offering. Only 3 letters, but I think they got me into the SW. I didn’t understand “air guitar”, but I invoked my First Law of puzzle solving which is that when there is something totally incomprehensible, assume first that there is a rock group lurking somewhere, and apparently “Journey” is indeed such. I was thinking that maybe the kids played air guitar in the back seat on long trips. “Suppurates” probably doesn’t pass the “Sunday breakfast on Beacon Hill” test, but I’m delighted to see that test abandoned. A quarter of a deck of cards is a suit. Each 13-card suit—clubs, diamonds, hearts, spades—comprises one-quarter of a 52-card deck. Thanks to Jeffrey and Pan. Funny how things that are pretty obvious will escape one. One of my card stunts (with a familiar plastic deck) was to deal 13-card bridge hands by cutting the deck three times (13 at a time, not half then half of each half.) I got it right about 2/3 of the time. Wasn’t just one suit, but you’d think it would have registered. Re: BEQ/joon – I would have been rather mystified by 1 A, DASHCAM, except for the recent meteorite incident, when many news programs featured pictures of the meteor taken by said dashcams, with the explanation that the Russian drivers have them as protection against the more common, Earthly, corrupt traffic police! Hooray for the ANODE clue (“Negative battery terminal”)! Finally. I guess the years of “Positive terminal” or, worse, “Positive battery terminal” bugged Joon as much as me. 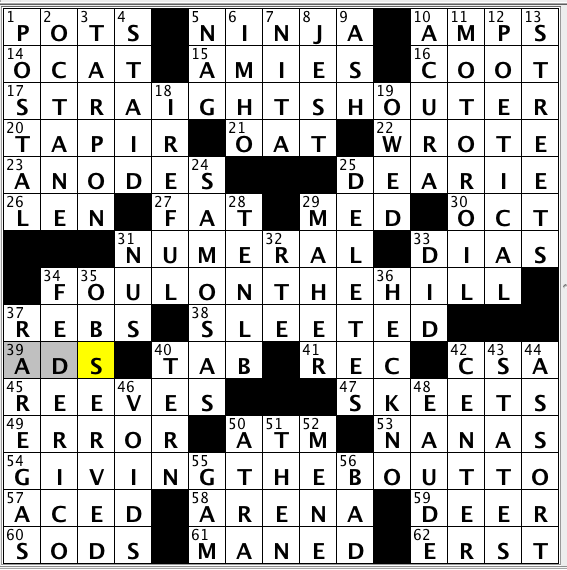 Will Shortz even did Joon the ultimate indignity of using such a clue in his puzzle recently. Old habits die hard. 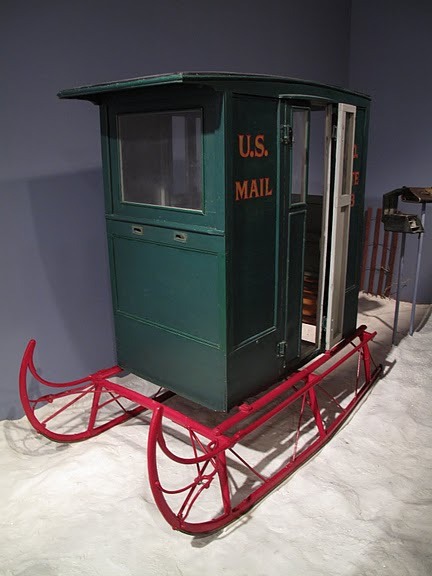 Re: LA Times puzzle — when I worked for the Postal Service some 40 years ago, the old-timers would correct anyone who called a mail POUCH a mail BAG; they said there were no bags in the Post Office. nb: Somehow the link to the trailer for Decasia was dropped; I’ve now rectified that. It’s a great, mesmerizing film, though I realize it isn’t for everyone.